Have you ever seen a bird that looked like it was wearing a costume? 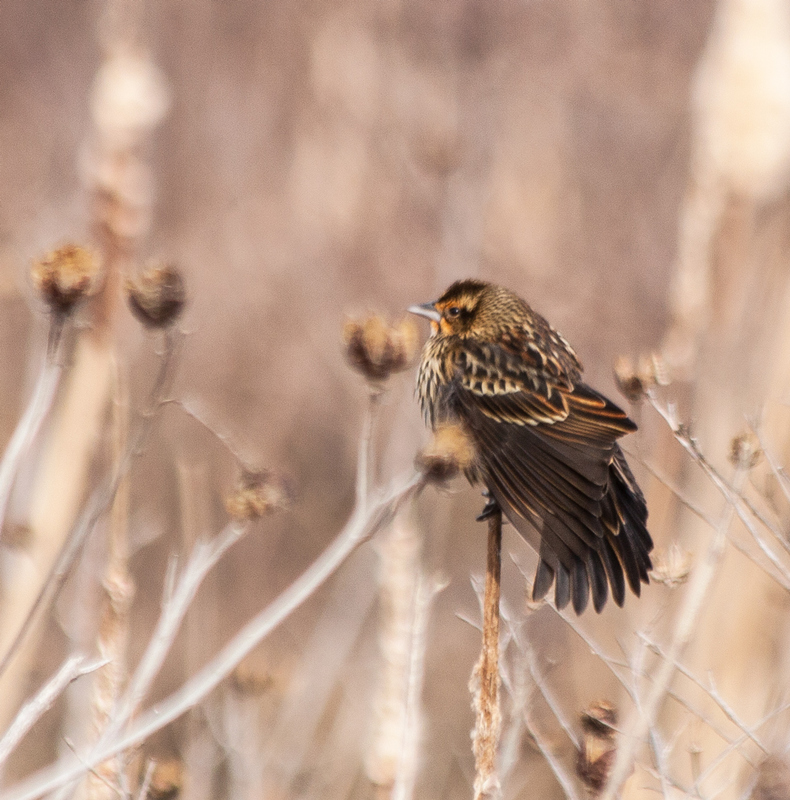 When I caught sight of this female Red-winged Blackbird (Agelaius phoeniceus) in the cattails last week, it looked to me like she had donned a large head scarf and an additional coat of feathers as protection from the cold. Do you like long walks in the rain? Although this sounds like a question for an on-line dating service, it’s really about your style of photography. I enjoy taking wildlife photos in the rain, if the rain is not coming down too hard and if it is not too windy. Of course, I can’t control the intensity of the rain, so I have various levels of protection. Generally, I’ll try to hold an umbrella in one hand and shoot one-handed, steadying my shot by leaning against the umbrella handle, if possible. If the rain starts to fall harder I’ll cover up my camera inside my raincoat or sometimes will pull out a plastic trash bag for additional protection until the rain slows down. 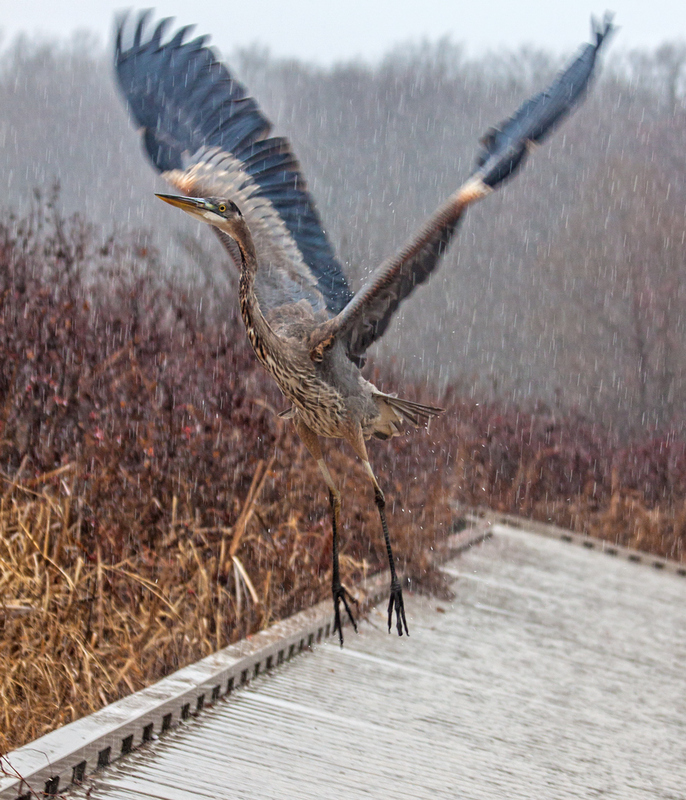 Last week, I was walking in the rain at Huntley Meadows Park, my local marshland park, when I came upon a Great Blue Heron (Ardea herodias), standing on the boardwalk. I approached the heron quietly and stopped. The heron was looking right at me and somehow I knew that it was going to take off. I dropped to one knee, turned the camera sideways, and pulled way back on the zoom lens, hoping to fit the heron into the frame. This image was shot at 75mm on a 70-300mm lens, so you can tell that I was relatively close to the heron. The other settings were f5, 1/400 sec., and ISO 500 for those who might be interested in the technical aspects of the shot. It’s always interesting to see which birds are active in the rain and I did get some shots of other birds that day, but I will save them for another blog posting. 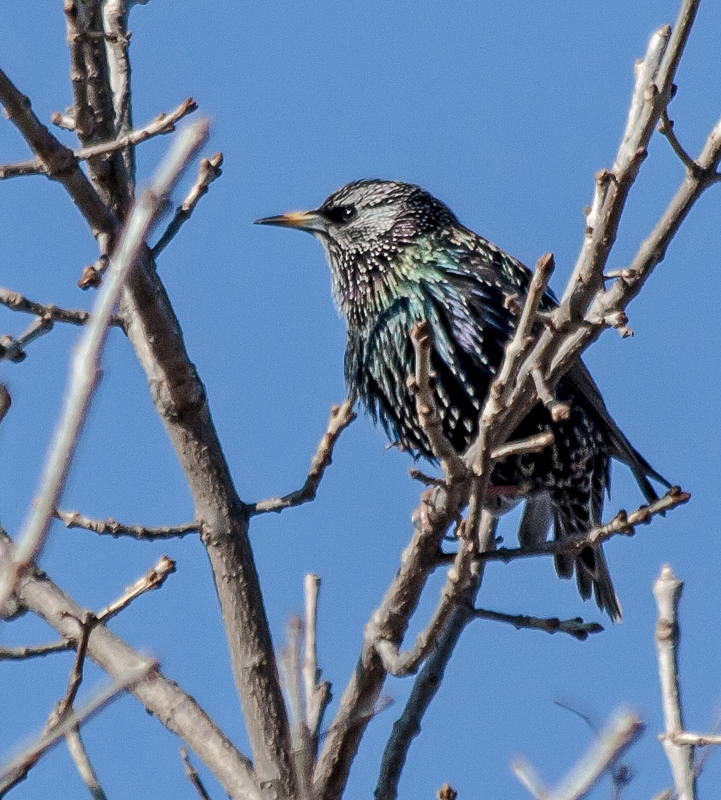 Starlings are supposed to be common birds, but I never knew what they looked like up close, so I initially had a lot of trouble identifying the odd-looking bird in these photos that I took in early December. 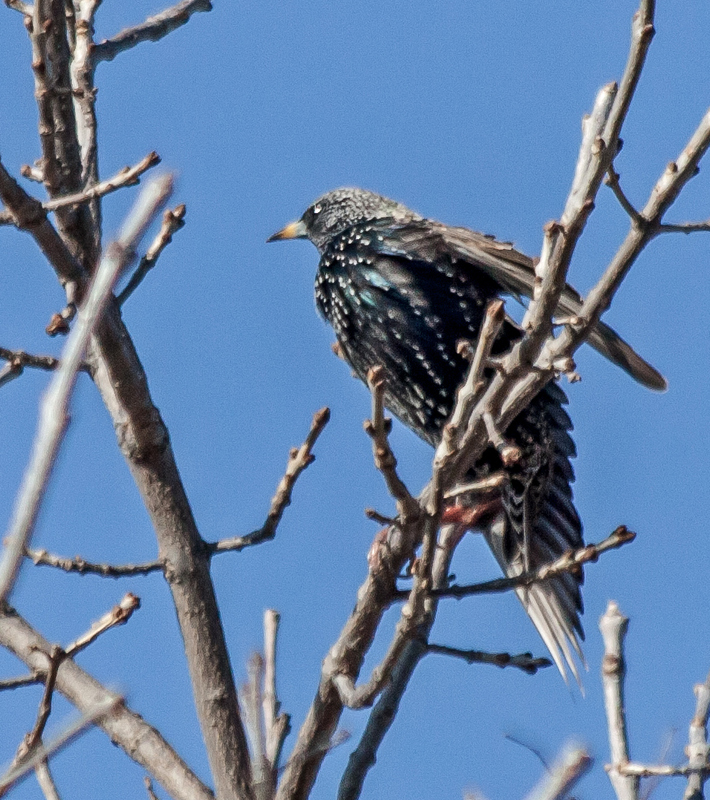 I’m pretty sure now that it is a European Starling (Sturnus vulgaris), a bird that was first introduced into North America in the 19th century by Shakespeare enthusiasts, according to the Cornell Lab of Ornithology. What does Shakespeare have to do with it? In 1871, a group called the American Acclimatization Society was formed in New York, dedicated to introducing European plants and animals and birds into North America, according to Wikipedia. The group’s chairman was an avid admirer of Shakespeare and is said by some to have desired to introduce every bird mentioned by the playwright. The Cornell Lab notes that the more than 200 million starlings now in North American are descendants of the original 100 starlings released in New York’s Central Park in the early 189o’s. Yikes! I am always curious about the origin of bird names and learned from the Cornell Lab that the starlings got their name because their wings are short and pointed, making them look rather like small, four-pointed stars when they are flying. I don’t ever go out shooting with the express intent of taking landscape shots, but sometimes when I am looking for wildlife to photograph, the natural beauty of the setting virtually compels me to try to capture it. That was the case last week, when I was at the location where I had photographed the otter and the fox and happened to glance up into the sky. 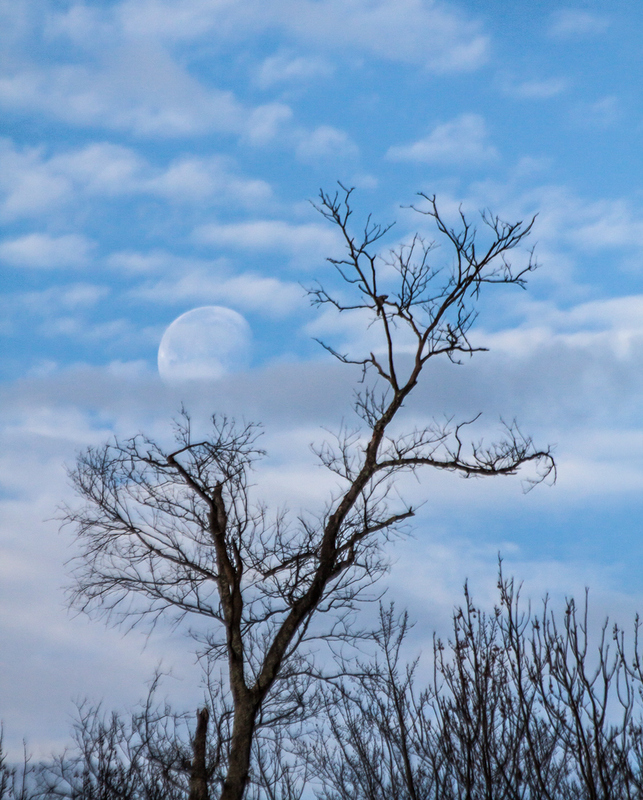 I was surprised to see how well the colors of the moon, which was pretty prominent for mid-morning, matched the colors of the clouds. 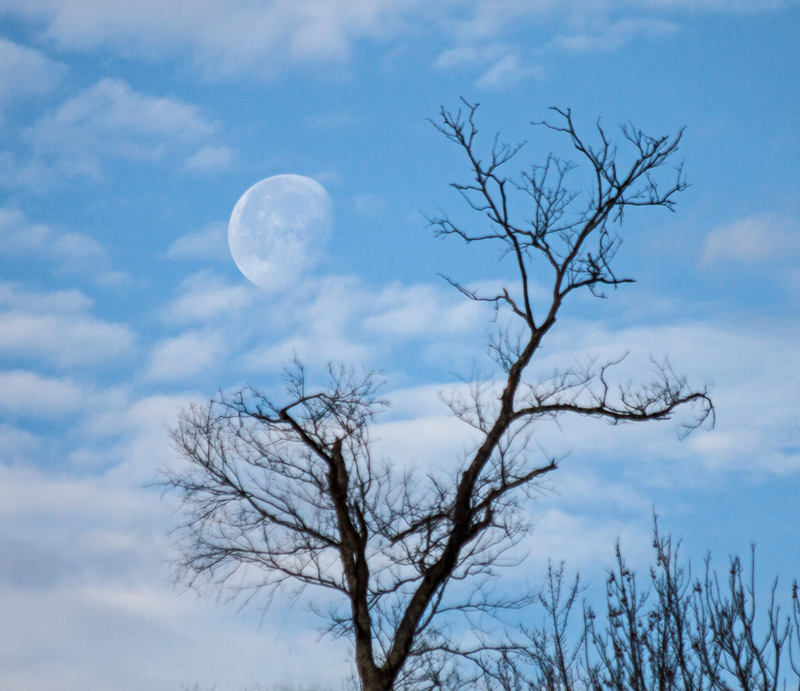 It was almost like the moon was a perfectly round cloud. I didn’t have a lot of room to maneuver in the thick underbrush to help me frame the shot better, so I tried to capture the scene in both portrait and landscape format. I think I like the first image a little better, but decided to include both views. My heartbeat accelerates every time I see a Bald Eagle (Haliaeetus leucocephalus), a combination of patriotism and awe at the power and beauty of this majestic bird. 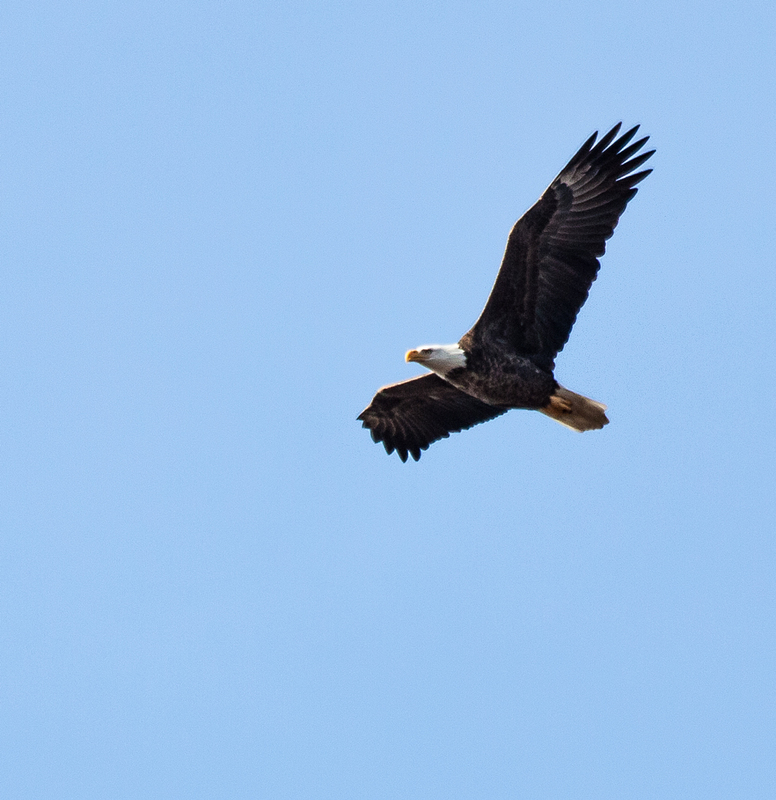 Normally the eagles are soaring high in the sky, making it almost impossible for me to get a decent shot. Last Saturday, though, one of them seem to be hunting and circled around me a couple of times at a somewhat lower altitude, which allowed me to get some shots of the eagle in different flight positions. I took these shots from the same spot at my marshland park where I recently saw an otter, a fox, and a raccoon. If only the park would let me pitch a tent in there. With the temperature in the 20’s (-5 C) the last few days, it’s hard to remember that we had record-breaking temperatures less than a week ago, when temperatures soared to 72 degrees (22 C). 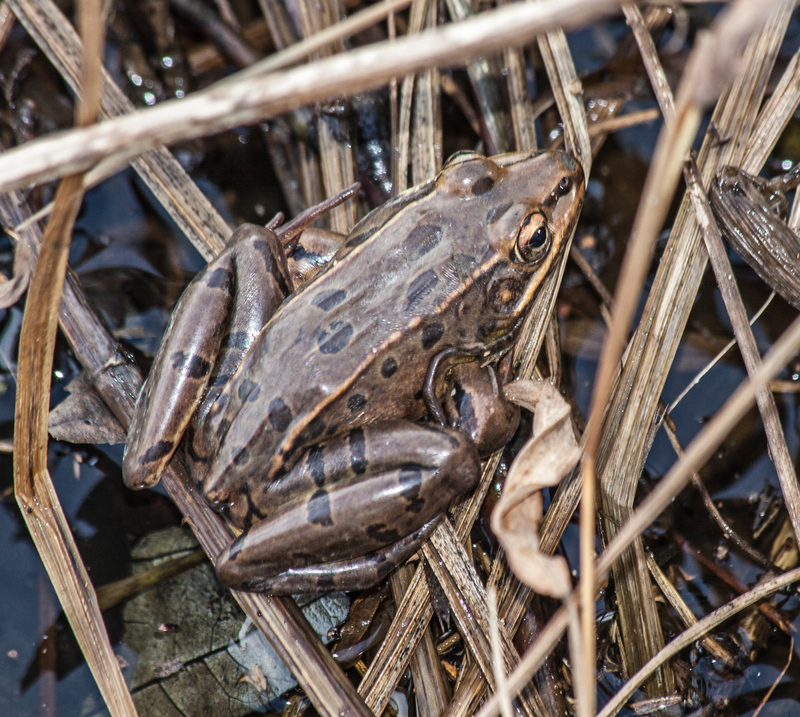 During a trip to my marsh on one of the warm days last Saturday, I was a little shocked to see some frogs out of the water, which not long before had been covered with a thin sheet of ice. I thought they would be in a hibernation state by now. The frogs were in the reeds and the ones that I could see were Southern Leopard frogs (Lithobates sphenocephalus), like the one in this photo. I figured that frogs buried themselves completely in the mud like turtles do, but was surprised to learn that is not the case. According to an article in Scientific American, aquatic frogs, like the leopard frog, do hibernate underwater, but they would suffocate if buried in the mud. Instead they remain on top of the mud or only partially buried. In addition to the frogs, a lot of small turtles took advantage of the unseasonably warm weather and could be seen sunning themselves on logs in the marsh. Unfortunately, there were no cameo appearances by dragonflies—my fellow photographer and blogger Walter Sanford and I searched diligently for Autumn Meadowhawk dragonflies, which we had seen earlier in December, but we came up empty-handed. 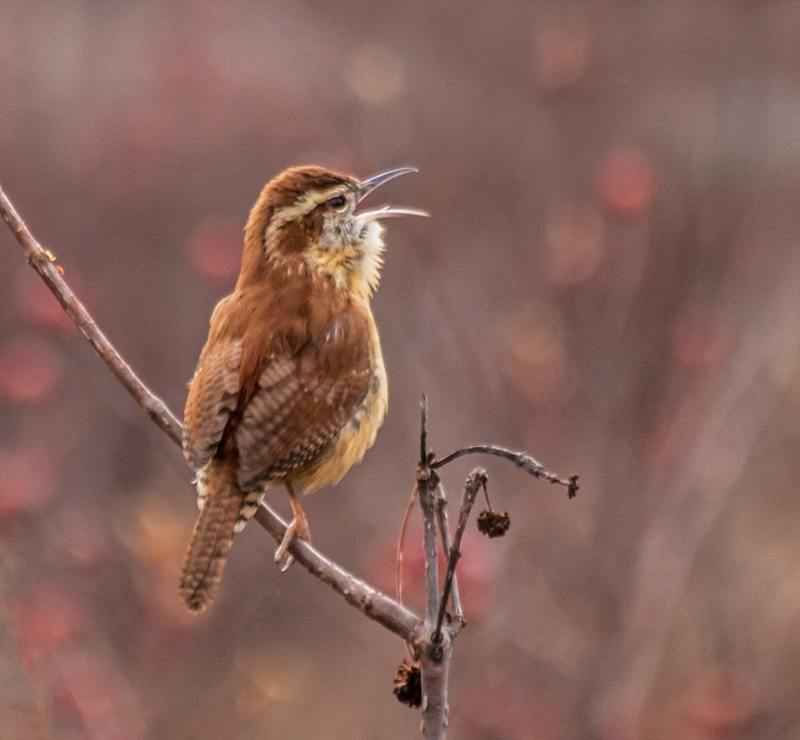 In this case, “nature” is a Carolina Wren (Thryothorus ludovicianus) that I photographed one recent morning, singing with all of its might.